If you are a Fibromyalgia sufferer then you should know that Treating Fibromyalgia Naturally can be a great way to be pain free. Aches and pains experienced for at least three months time may be an indicator of a more serious condition. Fibromyalgia is a condition facing many Americans and is defined as long term, body wide pain radiating from tender points in tissues, muscles and tendons. Fibromyalgia is linked to chronic fatigue, morning stiffness, sleep problems, headaches, numbness in feet and hands, depression and anxiety. If you have experienced 3 months of widespread pain in at least 11 of 18 tender points in muscles and fibrous tissues, you may have Fibromyalgia. These tender points are located in the: arms, chest, knees, buttocks, neck, lower back, ribcage, shoulder and thighs. Acupuncture stimulation of trigger points and tender points by an experienced acupuncturist can be very helpful. Medially Acupuncture stimulation of trigger points and tender points by an experienced acupuncturist can be very helpful. If you suspect you have this condition you may have to educate both yourself and your doctor. Often when complaining of symptoms of fibromyalgia, women have been dismissed by their doctors, told their problem was all in their head, or referred to a psychiatrist. Chronic fatigue syndrome and fibromyalgia must be taken seriously by physicians and women alike. 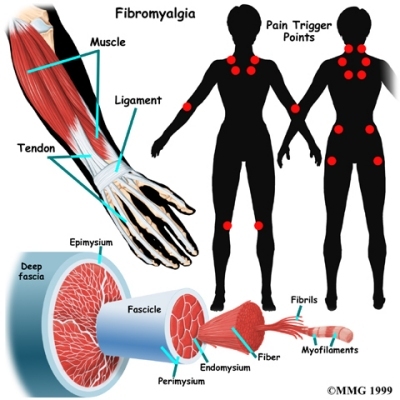 Fibromyalgia treatment should include treating Fibromyalgia naturally. The post Treating Fibromyalgia Naturally appeared first on Fitness Tips for Life.